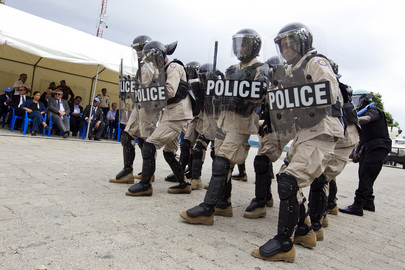 Reports of a mass killing by the US/UN occupation trained and supervised Haitian police in Port-au-Prince. Monday 11/13/17 was a day of extra-judicial killings of men and women estimated by community residents to total 14 not counting a number of disappeared according to Radio Timoun (Youth Radio). Police brutally beat teachers and students in Cap-Haitien who were demanding money for education, not to restore the murderous army. These killings were conducted by units of the Haitian police according to a number of survivors beaten by the police and other witnesses interviewed by Radio Timoun. It is also reported that at the very early hour when the police attack against the community took place, many children and adults were injured by the very potent tear gas used by the police. Also on Monday 11/13/17 in the northern city of Cap-Haitien, marching students shouting “Down with the army, long live education, long live schools!” were brutally attacked by the police using tear gas and batons. Many teachers and students were beaten and severely injured. Schools have been closed there for the past week. The students were saying no to the government’s plan to restore the old disbanded Haitian military. They are demanding that the money instead should be used to pay long overdue salaries to the already much-underpaid teachers. The demonstrators are also denouncing a reported plan by the corrupt US/UN-occupation government of Jovenel Moise (PHTK Party) to fire teachers en masse, replace them with his supporters and not pay them the overdue wages. Nevertheless, the students were back in the streets today, setting up desks and chairs in the middle of the street to illustrate that learning continues, even in the face of brutal repression, unpaid teachers, and police tear gassing classrooms.